This is a powerful and amazing statement. God the Father promised His “gospel” at a prior time (beforehand) “through” His prophets in the Holy Scriptures. The Greek word proepangellomai is translated “promised beforehand.” It’s in the middle voice and carries the idea of the “subject” of the promising of old through proclamation participating in the results of the action. The subject of the action had a vested interest in the outcome of the action. Think about that for a minute. Who proclaimed the Gospel beforehand? God. Who participated in the Gospel during Paul’s preaching of it? God. Thus, “the gospel of God.” It’s all of God! The only “Scriptures” Paul could have referenced at that time were those that had already been canonized in the Hebrew Bible. The last “prophet” of God in the Hebrew Scriptures was Malachi, who lived during the 5th century BC. The first prophet was Abraham, who lived during the 20th and 19th centuries BC. Can we really find the “the gospel of God” in the writings of the Hebrew prophets hundreds of years before Jesus came to Earth to “preach” the Gospel? The Apostle Paul was an expert in the Hebrew Scriptures. He had spent most of his childhood, youth and young adult years studying them; first with his parents, then moving from Tarsus to Jerusalem at about the age of 10 to study at one of the leading rabbinical schools in Israel (Acts 22:3). In addition to that expertise, Paul also learned directly from Jesus Christ (Galatians 1:11-18) and was also inspired by the Holy Spirit as he wrote his letters (1 Corinthians 2:13; 2 Timothy 3:16-17). 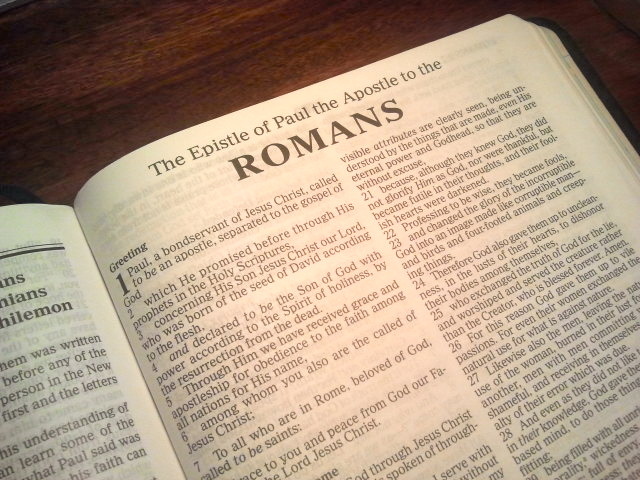 When Paul speaks about the Scriptures, I listen. The first Hebrew prophet to preach the Gospel was Abraham (Genesis 20:7), but first God preached the Gospel to Abraham. Remember that the Apostle Paul was an expert in Hebrew Scriptures, was a direct student of Jesus Christ, and wrote as the Holy Spirit moved in him to write. Paul wrote, “And the Scripture, foreseeing that God would justify the Gentiles by faith, preached the gospel to Abraham beforehand, saying, ‘In you all the nations shall be blessed.” Where does the Hebrew Scripture say that? Was that the first time God mentioned blessing all the nations of the earth in Abraham? No. Look at what God said several years before Abraham took Isaac to the mountains of Moriah. This Gospel that would come about in Abraham’s “seed” was preached from the earliest times. In fact, it was proclaimed in the Garden of Eden centuries earlier by God Himself. Who or what is this “seed” that is at the heart of the Gospel proclamation? We know that it is “seed” from the woman. We also know that it is Abraham’s “seed.” Let’s see if we can figure this out. The “seed” comes from Eve and Abraham. How can that be since Abraham lived hundreds of years after Eve died? We turn to our expert in the Hebrew Scriptures for the answer. Paul had the God-given ability to make things crystal-clear. Who is Abraham’s Seed? Christ. Did the Mosaic Law nullify the promise God made to bless all the nations of the world through Abraham’s Seed? No. Questions asked and answered. I don’t know how anything could be clearer than what Paul wrote for us to read. Faith in God’s “promise” is how the Gospel works. It does not work by works. It does not work by obedience to the Law. It does not work just because we want it to work. It works because of the promise God made to Abraham almost 4,000 years ago. Abraham was the first prophet to preach the Gospel, but not the last. In the next part of our study we’ll look at other Hebrew prophets who were part of the great lineage of “the promise” made beforehand.